What is MRO Inventory Management | Synovos - Supply and Assets. In Sync. Here is his premise: in a typical company-owned MRO storeroom, 90% of all parts account for about 6% of the inventory value. The majority of parts, he said, are either obsolete or duplicate parts for just-in-case scenarios that rarely happen. Those parts, as a result, are wasting away in the MRO storeroom. Companies are spending lot of money on rarely-used spare parts. But, as George said, it didn’t have to be that way. It appears that message is finally gaining acceptance as companies and entire industries are exploring ways to establish predictive MRO inventory management practices by tying the MRO storeroom and the issue of MRO supply chain management to specific assets and plant reliability. In short, a more efficient MRO storeroom provides the opportunity to turn reactive practices to proactive or, in this case, predictive. Earlier this year, Supply Chain Digital published an article on how the airline industry is “Unlocking predictive maintenance’s potential take partnerships.” While focusing exclusively on the airline manufacturing industry it’s not hard to extrapolate some of the article’s key points and implement them in most other manufacturing scenarios. One of those involves the collection and analysis of data. 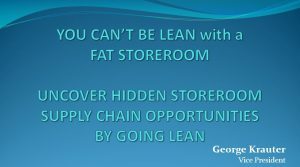 Then in October, Plant Services magazine published an article called “Trim the fat from your spare-parts inventory”, which takes a very similar approach to what George Krauter wrote and spoke about for years – reduce spare parts inventory, identify critical spares, use third-party vendors, etc. Entire industries are seeing the light when it comes to tying MRO spare parts to predictive MRO inventory management and it’s about time.